Shisha is considered a fast growing fad among different age brackets today all over the globe. The first invitation to try smoking a Shisha could have many reasons, why people agree to have this new experience. One of the popular reasons why people try to smoke Shisha is because, they are curious as to how Shisha differs from smoking a cigarette. A Shisha user can also have a different excuse as to why they are tempted to smoke Shisha. It could be they thought that the water in Shisha pipe filter the toxins in the tobacco; or they thought that since the Shisha tobacco has sweet fruit flavour it is more healthy to smoke than using a cigarette. Myth: Herbal Shisha is healthier than regular Shisha. Actual fact: Just like smoking herbal or “natural” cigarettes, herbal Shisha exposes the smoker to tar and carcinogens. Myth: Shisha is mostly molasses and not so much tobacco, so it is not so harmful. Actual Fact: Fruity flavours tend to mask the toxins present in Shisha. People are more likely to use it in excess amounts thinking they are only inhaling fruity flavours. 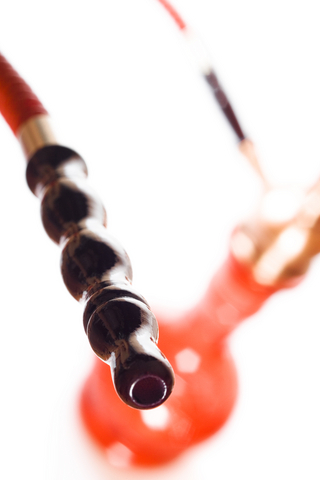 Myth: Smoking Shisha is not as addictive as smoking a cigarette because there is no nicotine. Actual Fact: Just like regular tobacco, Shisha contains nicotine. In fact, in a 60-minute Shisha session, smokers are exposed to 100 to 200 times the volume of smoke inhaled from a single cigarette. Myth: Smoking Shisha produces less nicotine than regular cigarettes. Actual Fact: Smoking Shisha and cigarettes produces nicotine that has approximately the same levels. Possibly when there is a difference, this will depend on Shisha tobacco, and usually Shisha users only use the best tobacco with greater nicotine levels. Myth: Inhaling Shisha smoke does not burn the lungs, so it is healthy. Actual Fact: The Shisha smoke does not burn the lungs when inhaled because is cooled through the water in the base of the Shisha pipe. But even though the smoke is cooled, it still contains carcinogens and it is still unhealthy. Myth: Smoking Shisha are healthier than smoking cigarettes. produced by heating tobacco in a bowl using charcoal. The end product of both cigarette and Shisha is the same—a smoke, containing carcinogens. Myth: The water used in smoking Shisha is an effective filter against carcinogens. Actual Fact: Depending on various factors such as duration of smoking, depth, length and frequency of inhalation; higher levels of carcinogens may be present in Shisha smoke compared to cigarette smoke. Aerosol, tar and heavy metal particles also are found in Shisha smoke. Myth: Smoking Shisha is associated with few long-term health problems than cigarettes. Actual Fact: Smoking Shisha can lead to various cancers, as well as heart and lung disease, much like cigarette smoking. In addition, diseases, such as hepatitis, herpes and tuberculosis, can spread when Shisha hose mouthpieces are shared. People that are addicted to Shisha might have all the different reasons why they are in their situations now. That they are misinformed, that they did not know these harmful effects of Shisha in the body; but you are different from them. Only from reading this article you had been armed with knowledge to do what is the right thing. You had already helped your self from the pit of Shisha addiction, and if it is in your good will to share this information; please do so for the sake of your a love ones, relatives, or even friends. I would like to add that our lungs have not been created to enjoy flavours. The main function of the lungs is to provide oxygen to the body and to get rid of carbon dioxide. If someone likes a particular flavour, then he or she could enjoy it in the form of a fruit juice or ice cream rather than inhaling it in the lungs with several liters of toxic fumes. In which later will only result to different kinds of illnesses. By smoking Shisha, smokers had been distracted to be more creative to utilize their leisure time for doing something useful. Whoever is thinking that Shisha is safe as compared to cigarettes, they need to get out of this misconception. Or you can help them to get out from this misconception. You have the power to make a difference. You are so biased it hurts my eyes to read this. First off, shisha does not contain all of the added chemicals and carcinogens that cigarette companies add to make cigarettes more addictive. Secondly, the Shisha is not actually being burned, it’s baked/vaporized due to the coals not actually touching the really wet tobacco. Hookah is not as bad as you say, you are very mislead and one sided. It’s ok to indulge in it every once in a while, it won’t kill you or get you addicted like heroin (which is what you made it out to be like). Hookah doesn’t destroy lives dingbat, I have acute asthma and I have hookahed 3 to 6 times a month for years now and I feel no different from the day I started. In fact, I don’t even like nicotine buzzes, I hookah for the social aspect (with a group of friends). My teeth are beautifully white and I work out and perform cardio exercises healthily throughout the week. Do not listen to this one sided extremist website, do the research yourself or even try it! The vapor is not hot, so it does not burn your lungs and you can use healthy alternatives when hookahing like all natural coals for example. Please do not listen to this misinformed website, they are not qualified to make such claims as they have. Nick, It’s great that you smoke so little and that you have not become addicted. I came here looking for info because I know someone close to me who is very addicted to smoking hookah, smokes at least an hour and a half each day, and has withdrawal when she cannot get access to a hookah. When confronted, she makes the same arguments as you. I do not think that this site is very comprehensive, but there has been, and there is ongoing research revealing that it is the volume of smoke which is the real problem. Yes, as you say, the smoke is diluted. However, smoking for thirty to forty-five minutes at a time(as most do on average) leads to inhaling much more smoke than a cigarette smoker, and the total amount of consumed harmful substances is thus equal or greater. As long as you keep it an occasional hobby, and not let it become a habit, you do not need this site. However, there are many who are addicted and misinformed who this site can really help. I am thankful that I stopped by in a website that can give and provide me lots of learning and knowledge. With the vast of same websites in the net, I can’t look for the best blog because of their similarities. At last, the rare blog I am hunting for many days is now in your site. Thanks a lot! This info could very well be true but you have to look at the risk/benefit. It is relaxing and helps to being people together. It tastes great and doesn’t leave your throat with the burning feeling a cig would. Now it is smoke and doesn’t have potential to be dangerous but most of the chemicals and nicotine is removed (by the tobacco company AND the aid of thr water). Plus it is cultural. I would rather go hookahing on a weekend night rather than go to a bar. Since it replaces drinking for me, I consider it healthy alternative. Yes, I know I should be home sipping tea and eating carrots to be the healthiest but really how good is that for your soul?? I’ve been hookahing for quite some time now and I won’t ever stop!